Take a refreshing break this weekend and break away from the hustle-bustle of the city. 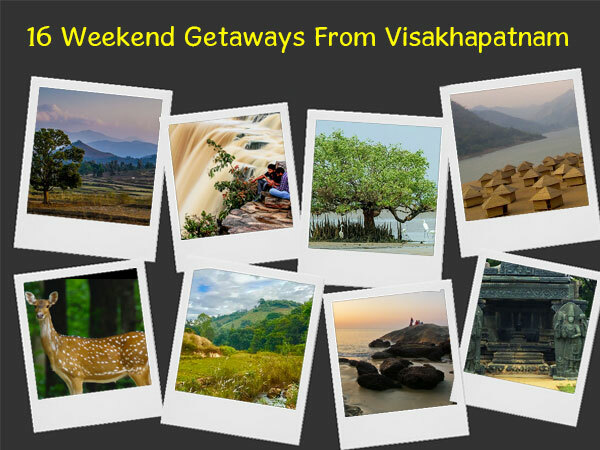 If you are from Vizag, Andhra Pradesh, take your pick from the numerous adventure, leisure, wildlife, beach and heritage destinations around Visakhapatnam like Coringa Wildlife Sanctuary, Gopalpur and Yanam Beach, Srikakulam, Araku Valley, Lambasingi and more. Plan that perfect weekend getaway with your friends, or your special one, or go solo. With numerous historical, heritage and wildlife destinations around, there's so much to explore! Take a look! Located about 100 km from Visakhapatnam, Lambasingi is a tiny hill station in the state of Andhra Pradesh. Given its lovely weather, Lambasingi is fondly called the Kashmir of Andhra Pradesh. Perfect for those long drives through misty roads surrounded by lush greenery, Lambasingi is an ideal getaway for those who want to escape the hustle-bustle of a city and yet don't want travel too far to find a peaceful place to relax and unwind. Surrounded by thick forests and mountains ranges of the Eastern Ghats, Araku Valley is a mesmerising hill station in the Visakhapatnam district of Andhra Pradesh. Apart from the abundant natural beauty, Araku Valley is known for its indigenous tribes and one can visit the Tribal Museum located in the area to know more about it. Visit this best-kept secret of Andhra Pradesh and revel in the beauty of some breathtaking landscapes and charming weather. Located on the banks of the Nagavali river, Srikakulam is a city in the north-eastern region of Andhra Pradesh. This city in the coastal district of Andhra shares border with a town in Orissa. With its numerous temples, Srikakulam is not only a place with religious importance but also historical significance. One can visit a number of temple ruins, Jain monuments and Buddhist relics from the ancient Eastern Ganga Dynasty dating back to more than 800 years ago. An erstwhile French town, Yanam is a small enclave in the East Godavari district of Andhra Pradesh. Dotted with coconut trees, the town of Yanam is located in the Indian union territory of Puducherry and on the banks of Gautami Godavari river - a tributary of the Godavari river. With a striking cultural significance and a rich colonial history, Yanam is an interesting place to visit. Located on the eastern bank of river Godavari, Rajahmundry is a city in the state of Andhra Pradesh. It is most popular for being home to a huge, riverside ISKCON Temple. A number of ghats or embankments of the holy Godavari river and bridges are worth visiting when in Rajahmundry. With its rich historical, traditional and cultural significance, Rajahmundry is also referred to as the cultural capital of Andhra Pradesh. Bounded by the Godavari river and surrounded by lush hills, Papikondalu is a breathtakingly beautiful tourist destination in Andhra Pradesh. Set of three hills, the Papi Hills are covered with thick tropical rainforests. Together they form a deep gorge on the Godavari river adding to the beauty of the surreal landscape. Reconnect with nature and bask in its beauty at Papikondalu for a rejuvenating weekend. Coringa Wildlife Sanctuary is located in the East Godavari district of Andhra Pradesh, about 18 km from the port city of Kakinada. It is a part of the Godavari estuary, which is believed to be the second largest stretch of mangrove forests in the country. Home to a number of species of birds, including some of the very rare and endangered ones, Coringa is an ideal place for nature and wildlife enthusiasts. The little village of Maredumilli located in the East Godavari district of Andhra Pradesh is known for its picturesque vistas and tranquil surroundings. It is the best place to experience the finest ecotourism projects in our country. Jungle resorts, exotic wildlife, abundant natural beauty, waterfalls and tribal communities - there is a whole of things to see, do and immerse in at Maredumilli. Located in the Ganjam district of Odisha, the town of Gopalpur is a famous getaway for the beach lovers. This famous beach destination was once a busy seaport. The ancient commercial port, which is now in ruins, can still be visited to get an idea of trade and commerce that was carried out here, once upon a time. Now a major tourist destination, Gopalpur also hosts plenty of beach festivals, adventure activities, etc. The heritage city of Jagdalpur is located in the Bastar district of Chhattisgarh. Jagdalpur was the erstwhile capital of the princely state of Bastar and therefore, one must not miss out on visiting the Bastar Palace located on the banks of the Indravati river to witness the historical riches of this place. Other must-visit attractions are the incredible waterfalls including Chitrakote and Chitradhara, Anthropological Museum and Kanger Valley National park amongst many others. With its name meaning "a victorious place", Vijayawada is one of the largest cities of Andhra Pradesh. Situated on the banks of the Krishna river in the Krishna district, Vijayawada is known for its rich history and heritage beauty. Some of the must-visit attractions in Vijayawada are the ancient rock-cut temples at the Undavalli Caves, the ornate hilltop temple of Kanaka Durga and Bhavani Islands amongst the others. Once a port town that welcomed the British, French, Arab and Dutch traders, today Machilipatnam is beach town located in the Krishna district of Andhra Pradesh. The city is also known by names such as Masulipatnam, Masula and Bandar. It is famous for its Kalamkari painting - a beautiful work of art on fabrics using vegetable dyes. The Bandar laddu is a must-try dessert for the foodie travellers when in Machilipatnam. Manginapudi Beach is one of the top attractions to be visited in Machilipatnam. The capital city of Odisha, Bhubaneshwar is believed to be the ancient capital of Kalinga - the historical region of ancient India. This historical city, therefore, is one of the ancient and most-significant cities of India. Famous for its numerous temples with stunning architecture and rich history, the place is a delight for history and art lovers. Travel back in time with a visit to the incredible temples and monuments of Bhubaneswar. The coastal city of Puri in Odisha is famously known as Jagannath Puri. The Jagannath Temple is the prime attraction here that draws a horde of tourists from all over the world each year for the massive festival of Rath Yatra or the Chariot Festival. Every traveller should experience this grandeur at least once in their lifetime. Puri Beach, Baleshwar Beach, Chilika Lake, Chilika Wildlife Sanctuary and Raghurajpur Artist Village are some of the places you must visit when in Puri. Overlooking the Bay of Bengal by the coastline of Odisha, Konark is another popular tourist destination in the state. It is most famous for the magnificent Sun Temple, a 13th-century architectural marvel. This iconic monument is a UNESCO World Heritage Site and a brilliant piece of art. One can visit the Konark Beach, the archaeological museum and a couple of other pristine beaches when in Konark. The Konark Dance Festival also draws a large number of visitors each year. The city of Warangal was once upon a time the capital of the Kakatiya dynasty. Located in Telangana in the present day, Warangal was historically known as Orugallu and Ekashila Nagaram, meaning "a city carved out of a single name". The rich heritage can still be seen through the numerous, impressive historical monuments and structures, the famous ones being Warangal Fort, Thousand Pillared Temple, Bhadrakali Temple and more. The beauty of the Pakhal Lake is also something which you mustn't miss when in Warangal. So, did we help you decide the destination for your next weekend break? We'd love to hear which place caught your fancy and which one you plan on visiting next. Drop a comment and let us know.